I’m starting this app with my initial idea. Consolidated Financial Statement are for a Parent Company with subsidiary and associate relationships. there are adjustments to be made for intra-group, depreciation, financial expense, etc. Currently the reports are available for individual company. I’ve copied 3 Basic Reports - Consolidated Balance Sheet, Consolidated Cash Flow, Consolidated Profit and Loss Statement. The Filter here is Consolidation instead of Company. Inviting community developers to help me out. Is my thinking and approach right? Any developer interested in paid development / freelancing please PM. If this becomes part of ERPNext then instead of a separate DocType for Consolidation, a child table can be added to Company? 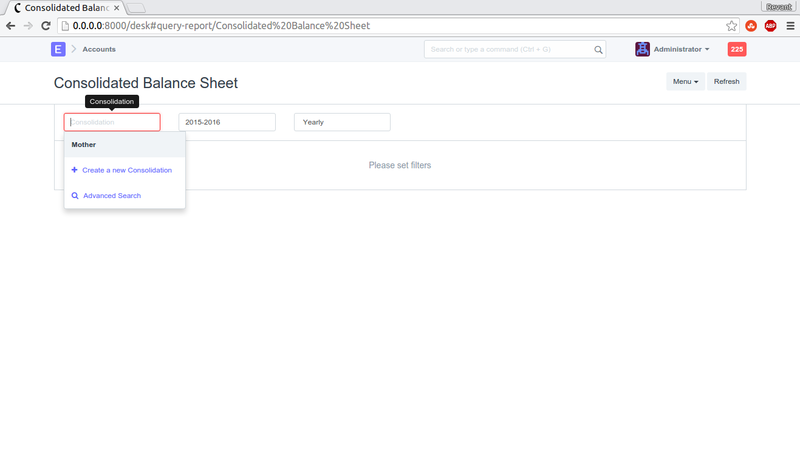 Instead of making new reports with Consolidation filter, same Reports with company filter can be used? may be a checkbox for consolidated report for selected company. No progress on data yet. Columns are same as other reports. http://www.ifrsbox.com/consolidation-example/ has an explaining xls file and a video. get_data is getting data for selected company, which can be used for list of companies. Any idea how to combine asset/liability/equity/income/expense for list of companies into one? @revant_one Any update on this report? Last commit on 14 Feb.
@revant_one I think this is an awesome addition to ERPNext. I have a couple of ideas. Consider adding a Doctype that portrays “stock structure” of sorts. The idea is to define for each company added to ERPNext, the type of stock issued, amount of shared of each type, and whether voting rights are given. The total amount of shares issued, being a sum of the three different types of stock mentioned above. You then set a Journal Entry that is linked to the purchase or booking of the 333 Type A stock for Sister Company. This automatically should update the “stake” to 33%. Now, if you book another journal entry of 333 shares of Type B stock, the stake should update automatically to 66%, which should also automatically update company to a “daughter” company. There should also be a clear specific definition of which percentage stake makes sister or daughter company, a setting per country. Clearly, the consolidation of statements should reflect the rules depending if it is an daughter or sister company. @revant_one The work you are doing is great.I am a CA and not a developer and willing to contribute my accounting knowledge in any way you want . Add Child Table on Company instead of Separate Doctype. Parent is Company and Child Table entries are % holdings in companies. Basic Fields : Company (link) and Percentage. Identify Validation / UI on Child Table, e.g. parent cannot be in Child Table. @Tropicalrambler can you start a github issue with checkboxes and detail specification, validations for handling relations, percentages, fields required, Child Table vs Separate Doctype? Post the issue here as well. I will start the Github issue right away. Thanks! @Fred1, @revant_one it seems that this Consolidation methodology is in full accordance with IFRS standards. I just reviewed the link above and it all checks out! Let us work on this. I have submitted the GitHub issue. @revant_one @tropicalrambler i hope this great work will not be limited to statement of financial position.Other reports like Statement of Comprehensive Income ,Statement of Cashflow, and Change in Equity should be considered for the project to be holistic. IFRS is a GAAP many nations have adopted and many more are joining.Nations that has not joined this GAAP can still modify the app revant is developing to meet their reporting need. @Tropicalrambler That will be great. How do I access consolidated statements in v7? Not existing yet, under development!